I first met Christine when I went to Texas A&M. She was my college pastor's wife, but more than that she was just flat out so fun to be around. I admired her instantly. After that I got to know her a little bit better when I was chaplain for my sorority and she was the alumni adviser. When I think of Christine I think of someone who who really loves the Lord and wants her life to mean something for His glory, truly... yet she doesn't get stuck up by that pursuit. She flat out enjoys life and has a very contagious smile. I have loved getting to stay up with her by blog stalking her constantly, she is a fabulous writer. You feel like you are sitting at her breakfast table and she is talking just to you. I know you will love her. I’ve found what works for me and my family instead of trying to do everything suggested by friends, blogs, Pinterest, Facebook, church, invitations, etc. I don’t try to do it all. In fact, when I’ve tried to do it all or attend every Christmas party or make cookies for everyone I know, I am so distracted by the busyness of the season that I miss Jesus entirely. I don’t want my kids to grow up missing Jesus in Christmas. I have chosen family traditions that center around Jesus and giving to others in His name. Because the season provides countless opportunities to talk about Jesus and why He came and why that’s important and our response to that, I try to take advantage of that. Traditions can provoke guilt if we let them. We feel like we have to create the perfect traditions to have the perfect Christmas. I remember feeling pressure to have our family’s traditions perfectly in place when my first child had his first Christmas at 8 months old! I’ve since learned that traditions are fluid: some are added accidentally, some are better when kids are older, and then some need to be changed when they are even older still. Traditions are not god, traditions should help us treasure God. My boys are 8, 6, and 3. In place of our normal family devotional, we use a daily Advent calendar and reading after breakfast each morning (we use Noel Piper’s calendar that is no longer available, but you can email me at christinehoover98@gmail.com for the reading). We sing songs, often using accompanying books that illustrate the nativity. We watch The First Noel movie together a lot during December. And, finally, we buy a new Christmas book each year. In each book, I write each child’s name and age. We read through these books often during December. That I have allowed myself to get too busy to reflect on and celebrate Christmas in my own heart. Do/did you do Santa? If you didn't, how did you explain it to your kid(s) so they weren't "that kid?" If you did, how did you explain that Santa wasn't real and did it break their trust in you? We don’t emphasize Santa, but we have conversations about him. Our culture is amazingly inundated with worldly representations of Christmas and so it is definitely something we talk about. However, I don’t want my children to see Santa as evil and I don’t portray Santa as evil. Really, I believe that when we explain Jesus well, there is no need to portray Santa as evil; he is around but a non-factor. This year, my 8 year old asked me if Santa was real. I said, “No.” We discussed why we celebrate Christmas and that Santa has nothing to do with that. We also discussed what to say to other children in his class (other kids were discussing whether Santa was real, which is what led to our conversation), that he shouldn’t argue with them, but that he has an opportunity to share that he celebrates Christmas as Jesus’ birthday. I want my children to be loving and gracious to outsiders. Each of my children get 1-2 gifts and a few stocking stuffers, such as candy. Already in our giving traditions, we adopt a student through our child’s school who needs clothes, shoes, and a coat for the winter months. My boys help me shop and, as always, we discuss that we’re giving to people in need because we love Jesus. The boys also help me make cookies and deliver them to friends, neighbors, and teachers. This year, for the first time, I’m going to help them give gifts to each other and to us, something they make or write that is meant as a blessing to the recipient. 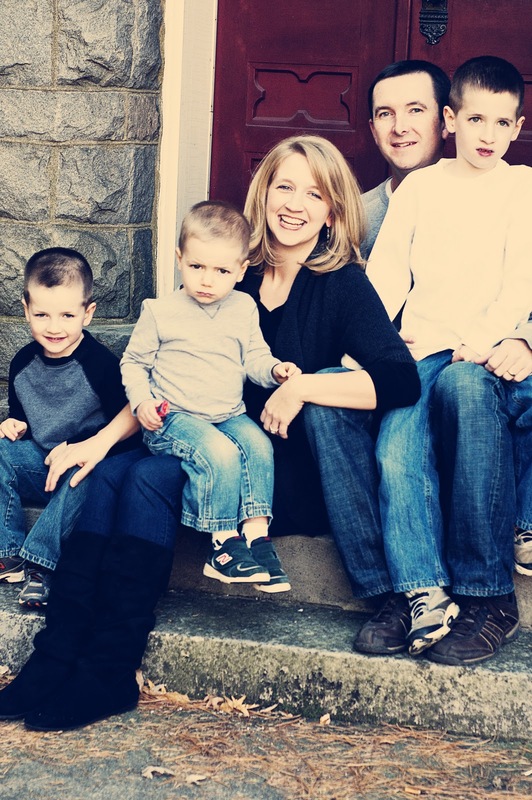 Christine Hoover is a pastor’s wife, mom, and writer who is learning to live and lead from grace. You can find her at www.gracecoversme.com. You can follow Christine on Twitter and Facebook.